The men, women and young adults who volunteer their time, talent and energy for Niagara Hospice are truly unique individuals. Many choose to work with our families because of their own experience with losing a loved one. Others have not yet experienced such a personal loss, but truly want to help those families who are facing the day to day emotional and physical struggle of caring for their loved ones. These volunteers help provide respite for the caregiver and/or services for the patient that include visits that take place in the patient's or caregiver's home, at Niagara Hospice House, at Hospice at Jeanne's House - A Northgate and Niagara Hospice Collaboration, at David's Path - A Schoellkopf and Niagara Hospice collaboration, and at other area long term care facilities where hospice patients reside. While visiting patients, volunteers may just talk, read the paper or a book to the patient, play cards, visit with their well-trained pet, or do other activities. They may also perform light housework or home repairs, provide transportation for shopping or medical visits for patients who are able to get out, or just provide a hand to hold while the family caregivers take a much deserved break. These specially trained volunteers provide intense support, encouragement and comfort to a family when the patient's death is imminent and the caregiver fears being alone or is unable to remain bedside 24/7. Vigil support is also available to residents receiving hospice care in nursing homes, assisted living facilities and adult homes. Many families take comfort in knowing someone is at their loved one's bedside when they can not be there, or if they just need someone for support. 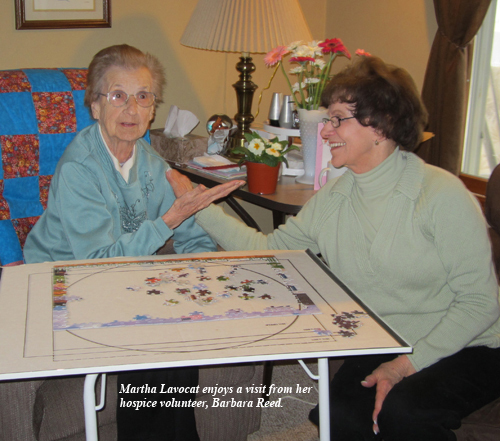 Some of our Niagara Hospice volunteers provide a variety of professional or technical services such as music visits and hairdressing. Volunteer drivers are also utilized to help with deliveries and transportation as needed. As part of the We Honor Veterans initiative with the National Hospice and Palliative Care Organization (NHPCO) and the Veteran's Administration (VA), Niagara Hospice actively recruits veterans to serve as hospice volunteers to visit patients who are also veterans. These veteran volunteers share a special and often meaningful camaraderie with their hospice patients receiving hospice care. Trained Niagara Hospice volunteers who have certified Pet Therapy dogs make visits to patients in their homes and at Niagara Hospice contracted facilities. These charming dogs have the unique ability to brighten anyone's day! For many in hospice care, a decline in physical condition impacts a patient's ability to enjoy socializing and maintaining human relationships over time. Pets often fill that relational void as they offer unconditional love, acceptance, comfort and companionship at a time when it's needed most. Pet Peace of Mind®, a groundbreaking national program, enables hospice patients to keep their pets at home throughout their end of life journey. For more information about volunteer services, contact the Volunteer Services Department at 716-280-0748 or send an e-mail to the Volunteer Services Department. Subscribe to receive event information!